Hot Sauce → Chipotle → Cholula Chipotle Hot Sauce 5oz. 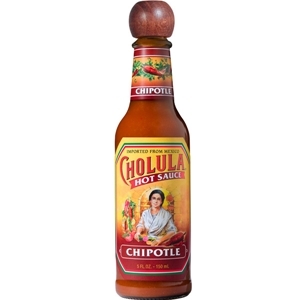 Cholula Chipotle Hot Sauce featuring a savory blend of Cholula's original "Flavorful Fire" and the smokey and slightly sweet flavor notes of real Chipotle peppers. It brings sensational new flavor to soups, ranch dressing, steaks, chicken and more. 5oz. Water, vinegar (white & apple), sugar, peppers (chipotle, guajillo, arbol and piquin), salt, natural flavors, spices, xanthan gum, silicon dioxide, citric acid& caramel.